The hardware works as promised, but at the moment, you might wonder what you're going to use it for. Doesn't autmatically add MIDI Input to other iPhone apps. MIDI Memo app is limited. 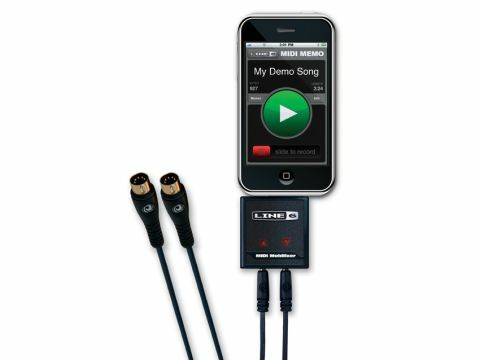 Line 6 joins the iPhone party not with an app but a piece of hardware: the MIDI Mobilizer is a MIDI interface for iPhone and iPod Touch. It's got an iPhone connector on one end, and 5-pin DIN MIDI in/out coming out of the other. Let's cut to the chase - it's not possible to plug this in and play existing apps from a MIDI keyboard. Developers will have to rewrite their apps to take advantage of the device, and there are a few caveats involved in this due to Apple's developer restrictions. For now, there's only one compatible app: Line 6's free MIDI Memo. It has a huge Play button and a slider to enable record. There's a menu to access previous recordings and an Info page to edit their names and send them via email. MIDI Memo does what it claims, recording and playing back MIDI with aplomb, but nothing more. Why not include a metronome, looping, MIDI file import and layering of recordings? OK, the hardware itself is what you pay for here, and it's high-quality, but it's disappointing that Line 6 hasn't given more of an incentive to actually buy it by making a decent app available upon its launch.